We’re going off the grid! Okay don’t get too excited yet, it’ll be awhile. I know in many posts I’ve mentioned our new homesite but now I’m finally going to properly introduce it and let you in on how we picked it out. For those of you who may not have seen previous posts we are building a home on property Scotty inherited. First off, we chose a spot on the ridge. It seems a little silly since we know that all the old homesites around here were down in the hollers. Those people made it out here so obviously they knew what they were doing. However I think we might too. This holler is dark and deep. That means less light for gardens, livestock, and us all year long. While it’s certainly doable to live down here (where we’re currently staying) we want to maximize our production. The downside to living on the ridge is the water. You can’t homestead without water can you? Don’t worry though we got a plan. 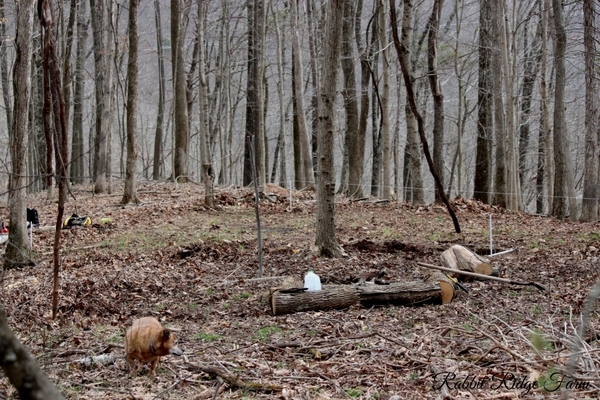 The ridge across from us has an old hand dug well (complete with water) that was used for a moonshine still a hundred or so years ago. We’re digging our own and hoping we get as lucky as the folks before us. Our little ridge is also made of clay. It holds water excellently so hello ponds! We plan to dam up drainage basins on the hillside for livestock and to irrigate fruit trees planted on contours. Plus if that hand dug well never reaches water at least we have a cistern. We also plan to utilize rain water. One of the reasons our homesite is not on the very peak of the ridge is so that we can have outbuildings above us and gravity feed water to our home. Lastly if it’s necessary we can pump water from a drilled well down in the holler potentially as we save to drill one on the ridge. Another reason we’re not right on top of the ridge is protection from harsh winds and storms. We’re still pretty high up but we have a hill on one side to block the weather for us. Once we established we wanted more light we knew we had to pick a ridge top. They may just be hills around here but make no mistake they mean business. These hillsides are just about straight up and down. Don’t get me wrong we’re totally about terracing hillsides and we’ll definitely be doing some of that eventually but gardens and any livestock but goats are going to be much more achievable, much faster on flat land. The ridge is perfect. It’s pretty wide and at a much more gentle slope than any of these hillsides. How do we get up on that ridge exactly? Well, there are two ways in. One is “the ridge road,” an unmaintained road that goes several miles up and around the hill to come in the back of our ridge. This is doable for us, especially in dry weather, in a 4-wheel drive pickup. The other is currently a ATV road that we cut on part of an old mining/logging road that switchbacks up the hillside on our property. This is what we use most frequently and we may pay to have expanded in the future. Stay tuned for two upcoming posts on the layout and clearing of our site and how we built our foundation! This post is linked to the Homestead Blog Hop. 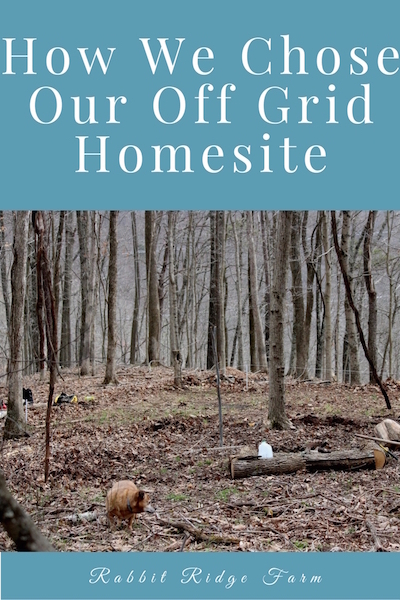 3 Responses to "How We Chose Our Off Grid Homesite"
Well done! It sure was a steep walk up there. But well worth it!